Use this manual when you need quick reference help. or otherwise, without prior written consent from Canon. Canon makes no guarantees of any kind with regard to this manual. reproduced in whole or in part without prior written consent from Canon. LBP, Canon, and the Canon Logo are trademarks of Canon Inc.
❏ Chapter 3: Using the Canon Advanced Printing Technology. printer, and how to replace the EP-22 cartridge. ❏ Appendix A. Lists the specifications for the printer. ❏ Glossary. Includes definitions for terminology used in this Guide. Indicates precautions that must be observed to prevent possible injury. in damage to the printer. Indicates notes and memos containing useful tips or detailed information. ❏ Reorient or relocate the receiving antenna. ❏ Increase the separation between the equipment and receiver. ❏ Consult the dealer or an experienced radio/TV technician for help. B of Part 15 of FCC Rules. be made, you could be required to stop operation of the equipment. product by the user, no radiation can leak from the machine. Federal Regulations, §1040.10 of Title 21.
sure to read the following instructions to handle the printer properly. ❏ Read the manual carefully before operation. ❏ Do not dispose of these instructions. Save them for future reference. ❏ Follow all warnings and instructions on the printer and consumables. ❏ Do not place the printer on an unstable cart, stand, or table. requirements described in this guide. ❏ Do not expose the printer to a wet environment. ❏ Do not install the printer where it will be exposed to smoke or steam. ❏ Be sure to connect the printer to a grounded outlet. spacers, and styrofoam molds) have been removed. into the outlet, contact an electrician to replace your obsolete outlet. Do not defeat the purpose of the grounding-type plug. or H05VVH2-F 3G 0.75 mm2 shall be used. printer power cord or interface cable. may lead to damage, overheating, short-circuit, or result in fire. flammable material caught between an opening might result in fire. overheating, result in fire, or cause flickering due to a drop in voltage. sofa, shag rug, or other similar surface. your nearest authorized dealer or the place of purchase. ❏ Keep the power cord and cables away from children. ❏ Do not handle plugs with wet hands. and unplug the power cord for safety. contaminate internal parts. Use a damp cloth for cleaning. liquid of any kind into the printer. • When the power cord or plug is damaged or becomes frayed. • If liquid is spilled into the printer. • If the printer is exposed to water. • If the printer is dropped or the cabinet is damaged. • If the printer produces smoke, odor, or excessive noise. pulling on the plug, not the cord itself. children to handle power cords or cables. compartments to qualified service personnel. ❏ Do not attempt to modify the printer. ❏ Do not remove the warning or instruction labels on the printer. • Make sure the location is flat and sturdy. • Make sure the surrounding area is well ventilated. • The printer must not be in a direct draft. air conditioners, or open flames. surface to deteriorate and degrades the printing. • Near magnets or equipment that generates magnetic fields. • Near areas subject to vibration. of salt or corrosive gases. • Near water pipes and refrigerators. prevent buildup of electrostatic charges. • Relative Humidity: 10-80% RH with no condensation. the printer or personal injury if the printer is dropped. Congratulations on your purchase of the Canon LBP-810 Laser Printer. This chapter introduces you to the printer and explains its features. energy-efficient printing, and trouble-free operation. means that you can print documents quickly and efficiently. consumption is very low, particularly when idle. LBP-810 over a network, without having to go through a server. Make sure that the paper you use meets the following requirements. *Only use index cards that are 0.18 mm to 0.28 mm thick. or perforations should not be used. dangerous fumes at about 190˚ C (374˚ F). printer’s fixing assembly (about 190˚ C or 374˚ F). matte-finish paper similar to copy paper. made of easily removable coated paper. serious paper jams to occur. envelopes that seal with pressure-sensitive adhesives. ❏ Do not use oversized envelopes, or envelopes with folds. ❏ Poorly manufactured envelopes are not recommended. ❏ Postcards should not be greater than 0.28 mm in thickness. ❏ Postcards should be free of glue, clips, and staples. coatings or an irregular shape. ❏ Store unused paper in its wrapping to protect against humidity. ❏ Do not store paper directly on the floor as the floor is usually humid. ❏ Keep paper on a flat surface to prevent excessive in-ream paper curl. ❏ Do not stack paper too high to prevent excessive in-ream paper curl. ❏ Do not subject paper to direct sunlight or a humid environment. handle paper loading and jams. Use the paper delivery selector to choose face-up or face-down delivery. When the selector is in the lower position, face-up delivery is selected. When the selector is in the upper position, face-down delivery is selected. To select face-down delivery, move the paper delivery selector up. from the slot. This could result in damage to the flaps inside the slot. ❏ Never insert paper or other objects into the face-down delivery slot. out from the face-up delivery slot face up. This helps prevent paper curl. To select face-up delivery, push the paper delivery selector down. selector while printing could cause a paper jam. postcards, or special paper with a maximum height of 12.5 mm. Follow the steps below to load a stack of paper. ❏ Do not fan the paper, or printing problems might occur. before loading them in the MP tray to prevent feed failures. the bottom of the MP tray. Slide the stack in until it stops. ❏ Do not force the paper into the printer. any paper higher than 12.5 mm. and the edge of the stack of paper. When reloading, be sure to remove any paper remaining in the MP tray. Stack it together with the new sheets before loading. delivery selection, see “Selecting Paper Delivery” on page 14.
the direction shown to flatten the envelopes. Align the stack of envelopes by tapping them on a flat surface. front of the printer. Slide the stack in until it stops. Adjust the paper guides to the width of the stack of envelopes. printer. Make sure your printer settings before you print. both edges of the envelope. with the flap at the back and on the right. the flap at the bottom and at the back. of the flaps of envelopes in a stack. of any of the other envelopes in the stack. want to use paper that is a different size from the paper in the MP tray. ❏ The manual feed has priority over the MP tray. envelopes. Confirm the feeding direction of envelopes before printing. card and feeds it into the printer. the LBP-810 as a Network Printer” on pag e 62.
and Parallel Port” under Windows 95/98/Me. ❏ Start Windows 95, 98 or Me. ❏ Turn on the printer (For details, see the Getting Started Guide). are using OSR2.1 or later. that its operation is approved by the manufacturer. ❏ Windows 95 is not available for USB. When using parallel port, go Step 3.
in the Add New Hardware Wizard and click Next>. and click Next > in the Add New Hardware Wizard. browse to D:\English\WinMe and click OK. The installation of the USB class driver will complete. D:\English\Win9x and click OK >. Enter the name you wish to use, then click Finish. When the installation is complete, the following dialog box appears. can use the Windows 95/98/Me Add Printer Wizard. same as “CD-ROM Installation” or “Plug and Play”. box appears. Click Next >. Select Local Printer and click Next >. The Wizard displays a list of available printers. Click Have Disk…. Select the printer, and click Next >. Select the printer’s port, and then click Next >. and Parallel Port” under Windows 2000. ❏ Start up Windows 2000. ❏ Windows NT 4.0 is not available for USB. When using parallel port, go Step 2. Printing Support” is automatically detected and installed. for the printer is necessary for the installation of the CAPT. The New Hardware Wizard dialog box appears. Click Next >. in the Found New Hardware Wizard and click Next >. “Unknown” may be displayed as the name of the device. Select Specify a location and click Next >. Browse… to select the driver in the language that you want to install. Click Next > on Driver Files Search Results. Click Yes if the Digital Signature Not Found dialog box appears. and Parallel Port” under Windows XP. ❏ Start up Windows XP. The Found New Hardware Wizard dialog box appears. Clear Search removable media (floppy, CD-ROM,...) check box. D:\English\WinXP, then click Next >. use the Windows NT Add Printer Wizard. Select My Computer, then click Next >. Select the printer port or ports you want to use, then click Next >. Click Have Disk… in the manufacturer/Printers dialog box. you wish to use, then click Next >. print a test page, then click Finish. the Canon LBP-810 icon is added to the Printers folder. use this printer. Click Next >. 12. When the installation is complete, the following dialog box appears. use the Add Printer Wizard. same as “Plug and Play”. Select Local printer, then click Next >. Click Have Disk… in the Manufacturers/Printers dialog box. 13. When the installation is complete, the following dialog box appears. print a test page, then click Next >. Select Local printer attached to this computer, then click Next >. download is not available, you can use the Add Printer Wizard. the drivers for the LBP-810 automatically. order for Windows 95/98/Me clients to use network download. Select Network printer, then click Next >. for the printer, or accept the default name and click Next >. be able to use the printer until it comes back online. Follow the instructions on screen to finish the installation. means the server is a Windows 95/98/Me computer. Follow the directions on screen to complete installation. Click Add a printer. The Add Printer Wizard dialog box appears. computer, then click Next >. The Specify a Printer dialog appears. 4.0/2000/XP print server, or vice versa. not running when the client was started. Double-click the Network icon in the Control Panel. Select the Configuration tab, then click Add. Select Service, then click Add. Select Microsoft in the Manufacturers list box. Network Services box, then click OK.
Click OK and then restart Windows. As” in the Sharing tab. Enter the Share name, Comments, and Password as needed. Enter the Share Name and Comments, as needed. Click Add, and select the users allowed to access the printer. Click OK when you are done adding users. Do not enter space or special character in the Share Name. Double-click the Network icon from the Control Panel. Select the Services tab, and if the Server is not shown, click Add. Select the Server, and click OK. The Network and Dial-up Connections folder appears. The Local Area Connection Properties dialog box appears. Click Network and Internet Connections icon in the Control Panel. list, click OK. Otherwise, click Install. Enter the Share Name as needed. Click OK. The printer icon changes to indicate sharing. Sharing settings may also be made during installation. execution of job operations requires Manage Documents authority. supported if IPX/SPX is the only protocol used. When you install the CAPT, the Canon CAPT Tools group is created. 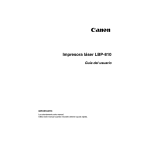 Selects the Canon LBP-810 Help file for the CAPT. Displays the LBP-810 Status Window. details, see Chapter 4, Troubleshooting. end connects directly to your computer. You must use a bi-directional cable for proper operation. or delete the current print job. automatically opens and identifies the problem. the Setup program, you are ready to print. Canon LBP-810 Properties dialog box and its printing options. how you have your system set up. Screens examples use Windows 98.
operating system documentation for more information. system documentation for more information. The installer sets the following defaults. For information on Profiles, see page 75.
automatically reduced or enlarged to fit on the page. Copies lets you specify the number of copies to be printed (1-999). Page Layout lets you select the number of pages per sheet (1, 2, 4, 8, 9). Scaling disappears and Page Order appears in its place. the check box to set a reduction or enlargement percentage (10-200). tabs in the View Settings dialog box to view the settings for each tab. width, and height of each form. You can have up to 3 custom forms. Select one of the predefined forms from the Custom Paper List. If you wish, enter a unique name in the Name area. Select the Units of measurement (Centimeters or Inches). can automatically print your logo on letters you create. Use Browse… to select the file that contains the overlay data. File Name displays the currently selected overlay file name. from the paper’s left and top edges. Size lets you set the size of the overlay. Units lets you select the units of measurement (Centimeters, Inches). be stored for each user. Profile lets you select profiles from a pull-down menu. Add… opens the Add Profile dialog. Add… on the Page Setup, Finishing, or Quality tab. Name lets you specify the profile name. Icon lets you select an icon to represent the new profile. View Settings >> shows or hides the profile’s settings. Edit… opens the Edit Profile dialog. you edit an existing profile. in this list is the order they appear in the pull-down menus. Delete lets you delete the selected profile. Import… lets you import profile information from a file. Export… lets you export the selected profile information to a file. printer to its original name. ❏ Profiles are not erased even when the printer driver is uninstalled. ❏ Overlay history information is not stored in profiles. setting for this option is unchecked. image. Different halftone patterns give different gray shade results. brightness darkens the overall image; increasing brightness lightens it. Brightness is expressed as a relative range from -80% to +80%. ragged curves of characters and graphics. in the Printers folder and select Properties from the pop-up menu. Document Defaults...** from the pop-up menu. selecting Print or Page Setup from the File menu of an application. select the item of interest. definitions must conform to the printer’s specifications. Selected Forms shows the three form names. For information on Profiles, see page 90.
will be off. These settings are unchecked by default. Tells you exactly what is happening with the current print job. ❏ When an error occurs or user action is required. If multiple LBP-810 printers are connected, select a printer from the list. icon in the Windows taskbar and selecting the LBP-810. Status Window and the printer. Displays the current status of the printer. red when a warning is issued. Indicates the progress of the current job. Use to pause, delete, or resume printing. Displays information related to print jobs. ❏ Pause Job—This temporarily halts printing of the current document. you change the settings for the Status Window. progress or when there are errors. ❏ Status Window—lets you select when the Status Window displays. Window opens automatically each time you print. Window opens only when an error occurs. in the Windows taskbar, and then click the Canon LBP-810. changed settings do not take effect until the next print job. ❏ Sounds—lets you select when sounds do or do not play. • Play all sounds—A sound plays whenever there is printer activity. • Do not play any sounds—Sounds do not play. • Sound Type—Determines which sound files to play. ❏ Status check—lets you select when the Status Window is active. monitoring the printer only when printing a job. ❏ Standard—uses the parallel port as a standard parallel port. that does not use Direct Memory Access (DMA). computer to determine what type of port you have. ❏ Help Topics—Displays the search window for help topics. ❏ About—Displays Status Window version information. Pause Job: Temporarily halts printing the current document. The current page finishes printing. box. Select all of the jobs and delete them. When the Printed Job tab is selected, none of the buttons are displayed. with the next page of the document you paused. This tab shows information related to the job that is currently printing. up to 100 jobs, beginning from the time the Status Window was started. The job history clears whenever you terminate the Status Window. This tab shows information related to the jobs that have not yet started. server’s Status Window must be running. automatically once printing from the server starts. interacted with the window or its menus. that the operation has been accepted. 4.0/2000/XP any authorized user can perform print job operations. Audio messages for jobs play on the client and on the print server. table below shows the Status Window icon and the taskbar icon. Indicates that the printer is ready to print. Indicates that printing has paused. until you take the action specified in the full-size window. An error has occurred and the printer may require service. Letter,” use the following table to determine which size paper to use. Custom form: You defined the name. CAPT can play these sound messages. the event that triggers each, and the message’s filename. computer malfunction, software errors, the printer cable, or the printer. in that area. Be sure to check all areas before resuming printing. the jammed paper from the affected area. Open the front cover with both hands until it stops. lifting it out of the printer. to prevent exposure to light. and scratches, which may lead to print deterioration. fingers, so they release the bar. right end of the transfer roller. Please use both hands to remove jammed paper from the printer. the paper scraps from the printer. Remove any paper from the input area by gently pulling it forward. printer. Gently pull the paper out of the printer. automatically return to their original positions. area. Then gently pull the rolled paper out of the printer. Carefully pull the jammed paper forwards and out of the printer. until the leading edge emerges from the printer. ease the jammed paper loose and then pull it out of the printer. the paper transport slit at the back of the fixing assembly. hands, wash it off with cold running water. Gently pull the paper through the rollers. Open the front cover and take out the EP-22 cartridge. Insert the cartridge into the printer. Close the front cover and try to print again. Cartridge” in the Getting Started Guide. one for this printer: a Canon EP-22 cartridge. on the average page coverage of your printed documents. diameter or larger might appear on the front or back of the printed paper. page on a blank sheet of paper. procedure several times with no adverse effect on the printer. This occurs with high-volume printing in a hot environment. If this has no effect, replace the EP-22 cartridge. is, move the printer or the light source. Paper might not be loaded. Print jobs might be stalled. might need to be modified. printer and the AC outlet. you give your print job priority. less than 6.6 feet (2.0 m) long. selected in the Printers folder. if this solves the problem. Verify that you have a highquality shielded interface cable. both the printer and the computer. loaded in the paper tray. Reset the printer and computer. Try the print operation again. LBP-810 as the default driver. and click [Device Manager] button. and uninstall from the [Action] menu. uninstall from the [Action] menu. print job in the Status Window. disconnected, or the cable is not bi-directional. automatically when the paper jam is fixed. jammed paper. Other times, alerts tell you what is wrong and how to fix it. The print job was too complex for available memory. ❏ Close other applications while printing this job. ❏ Print the job in smaller sections. to reduce graphics and other complex formatting. The printer port is being used by other equipment. destination has been changed during printing. internal problem in the LBP-810 engine. 1 Turn off and unplug the printer. 2 Open the front cover and remove the EP-22 cartridge. 4 Plug in and turn on your printer. as printer cable problems, parallel port failure, or ECP setting errors. If the Trouble Shooter encounters a problem, it displays an error message. service has started and if not, displays a dialog box and does not run. box similar to the one below. desired filename. The file saves with the extension of.log. Trouble Shooter to take effect. Click the Start button, then point to Programs. Point to Canon CAPT Tools. Windows 95/98/Me: Click OK and your system restarts. Printing Technology unless you have administrative privileges. care and maintenance helps keep your printer in good working order. ❏ Do not place any heavy objects on the printer. ❏ Do not insert paper or other objects into the face-down delivery slot. not open the front cover. If you do, the printer might be damaged. cooled off completely before covering it with a dust cover. unplug it from the AC outlet. ❏ Never attempt to disassemble the printer. Clean the printer cabinet regularly to keep the printer in its best condition. cleaning, wipe the cabinet with a dry cloth. Before cleaning the printer, always unplug it from the AC outlet. be damaged and electric shock may even occur. Do not lubricate the printer. This printer does not require lubrication. becomes caked or unevenly distributed inside the cartridge. 35˚C (between 32˚F and 95˚F). CRT, or damage data on disks. damaged, print quality might deteriorate. touching the drum’s protective shutter. Do not dispose of toner cartridges in fire. Toner powder is flammable. • Do not attempt to disassemble the cartridge. the cartridge life is shorter. cover until it is fully open. Grasp the EP-22 cartridge by its handle and lift it out of the printer. Place letter or A4-size paper in the MP tray. Click on the printer icon in the taskbar to open the Status Window. “Cleaning” and when printing completes, it returns to normal. connected to the network adapter through a print server. printer) into the network adapter. You must install the print monitor for the network adapter on each client. When using the Add Printer wizard, you must connect directly to the network. in the port settings dialog box. printing order, cancel jobs, etc.) centrally. the printer server. It is not necessary to install it on each of the clients. Windows 95/98/Me server and a Windows NT 4.0/2000/XP client. Windows XP supports only the TCP/IP protocol. Install NetPilot and the Print Monitor. Select the network adapter from the displayed list. Enter the network adapter settings. NetPilot runs on Windows 95/98/Me and Windows NT 4.0/2000. Connect the network adapter to the network. available port. For more information, see the network adapter manual. display their printer status and features. adapter, see the documentation that came with your adapter. network. See also Peer-to-peer connection. Printing Technology software and a local printer. representation. Also referred to as emphasized or double-strike printing. darkens the overall image; increasing brightness lightens it. Interface port and Parallel interface. An instruction that tells the printer to perform a certain function. cable when the printer is ready. areas; increasing it darkens the dark areas and lightens the light areas. A setting that is automatically used if no other setting is specified. The entire Windows screen that represents your work area in Windows. Icons, windows, and the taskbar are displayed on the Windows desktop. Dots per inch. A unit of measurement for indicating a printer’s resolution. The LBP-810 prints at a resolution of 600 dpi. stored on your disks. Formerly referred to as a directory. A custom paper size, with width and height defined by the user. than as black or white. (unprinted) dots that simulate the gray shades in the original image. which makes it compatible with IBM and similar personal computers. between a printer and a computer. located on the back of the printer. See also Parallel or USB interface. characters are at an angle to the vertical axis). must remove jammed paper before you can continue printing. describe printer or computer memory size in thousand-byte units. The printing of text and graphics along the length of the page. printer or computer memory size. moving, copying, renaming, and deleting items. This utility is used to control network printers. The act of guiding a sheet of paper into the printer’s paper path. The route that paper travels through the printer. interface. See also Centronics interface. be read or printed out with Adobe’s Acrobat Reader program. that does not go through a server. See also Server, Client. computer in the form of memory chips, as opposed to virtual memory. Character height is defined in points: one point is 1/72 of an inch. The printing of text along the width (short edge) of the page. Spooler to be added to the print queue or directly to the printer. A list of files that are either waiting to be printed or are currently printing. Once a file has been printed, it is removed from the print queue. Advanced Printing Technology, you are using its printer driver. The container in which your printer information is stored. recreated simply by selecting the profile from a menu. indicates the percentage of the print job that has actually printed. makes text easier to read. RAM to the computer. See also Physical RAM, Virtual memory. have a jagged appearance, but prints faster than higher resolutions. Enlarging or reducing the printed image. separate one print job from another. A file containing audio information that can be played by a sound driver. sound files that play to indicate printing conditions. clicking the Start button displayed on the Desktop. whether sounds play with messages. print job’s progress from computer to printer. the printer via an electrophotographic mechanism. pausing, resuming, and deleting the current print job. the disk drives, folders, and files on your computer in a network system. manage your files by moving, copying, renaming, and deleting files. the printed page are exactly the same as they are on the screen.